Until last year, I hadn’t been to San Diego since 2001 – a long time by any measure. Then, through a variety of quirks of fate, I suddenly found myself visiting three times in a single year. Those repeat visits not only made me appreciate the city much more than I otherwise would have, but it also helped me fine-tune what I love doing most in the city. My final visit of 2018 was sailing with Crystal Cruises onboard the Crystal Serenity; San Diego was the final port of call before disembarking in nearby Los Angeles. We had the entire day to explore the city, and I was excited to make the most of it. Instead of feeling compelled to visit certain sights or famous attractions, I simply did what I enjoy the most and thanks to that, it was my favorite visit to beautiful San Diego. The Crystal Serenity docking location was next door to the USS Midway Museum in downtown San Diego, providing me with the perfect opportunity to finally visit this amazing facility. The U.S.S. Midway entered into service in 1945 and served the country until it was decommissioned in 1992. That wasn’t the end of its long life though and in 2004 it opened as a museum along the San Diego waterfront and quickly became one of the city’s top tourist sites. I spent the entire morning exploring the many aircraft and exhibits onboard the Midway and a whole day could easily be devoted to this remarkable museum. They’ve done an outstanding job in telling both the story of the Midway as well as modern U.S. history and I know that it won’t be my last visit. San Diego is a quirky place, at least I think so and like so many other cities the downtown core has changed a lot in recent years. One spot that hasn’t changed too much though is another key reason to visit the city, Balboa Park. The nation’s largest urban cultural park, it’s been a public space since before there was even much of a city. Its time in the proverbial sun though came during the 1915 Panama–California Exposition, which created much of the park’s current look and feel. This massive event lasted two years and completely transformed San Diego. It truly came of age during the fair, and at the heart of the experience was Balboa Park. Meant to be reminiscent of Spanish Colonial architecture, the buildings are actually a hodge-podge of design, but that doesn’t detract from their beauty even today. Weeks could be spent exploring the park’s many museums and public spaces, including the world famous San Diego Zoo, but one of my favorite spots in the park is the Museum of Man. 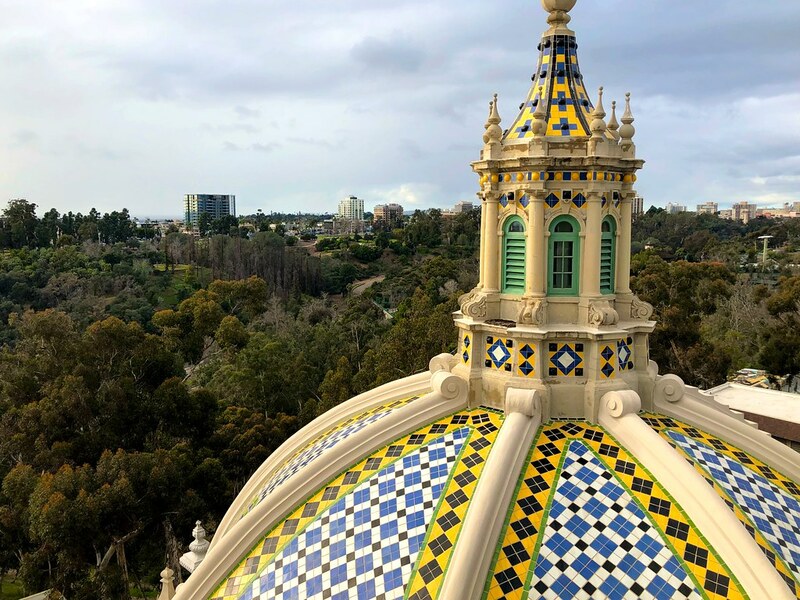 Showcasing a rotating set of odd but interesting exhibits, the real treat here though is the opportunity to climb to the top of the California Tower for incredible views of the park and San Diego. Only accessible if you join the special tower tour, the extra fee is worth it not just for the panoramic views, but for the interesting history shared by the guide on the way. I knew exactly where I wanted to spend the afternoon and the rest of my brief stay in San Diego, in the always beautiful La Jolla. One of the most popular places to visit in the greater San Diego region, the beauty of La Jolla cove and beach can’t be denied, especially as the sun begins to set. One of the county’s most posh communities, just being in this small city is an experience in its own right, as I was reminded of during a leisurely late lunch al fresco, enjoying the region’s near perfect weather. I wasn’t there though just to have a nice meal outside, I was there to once again spend time exploring La Jolla including one of the main tourist draws to the town, the seals. Basking on the rocks along the cove are hundreds of seals and sea lions, completely disinterested in the many tourists who visit them every day. While you’re at seal rock, venture a little further up to visit Sunny Jim’s Sea Cave Store. The only sea cave with access from land, for a small fee you can venture down below to see this natural wonder for yourself. Walking along the promenade there are many other scenic overlooks and special spots to enjoy, including the Children’s Pool. The wealthy philanthropist who very much created the modern allure of La Jolla, Ellen Browning Scripps, paid for the breakwater that created the pool – designed as a place where kids could play and swim protected from crashing waves. It’s now home to a colony of harbor seals who have made it their own and which, thankfully, is closed off to the public for about half of the year. Next to it though I noticed a concrete set of stairs leading down to a small beach. While definitely not a secret – several tourists were there trying to capture shots with a small group of seals – I decided to investigate and found a great spot to watch relax and admire the scenery. Being back in La Jolla reminded me of what makes Southern California so special. A little glitzy, a little laid back and radiating with beauty, there’s no place quite like it and I know that I definitely fell under its spell once again. At first I thought that visiting San Diego on a cruise would be a little strange, especially since I’d so recently spent time there. It was the perfect day though, thanks to the docking position of the Crystal Serenity downtown and the natural wealth of experiences that San Diego has to offer. Even better, since I knew the city I didn’t feel like I had to rush in order to tick items off a list. No, instead I spent a leisurely day doing only those activities that I love most and thanks to that it was one of the best days of the trip. Travel is about a lot of things, and discovery is certainly one of them, but it’s also about balance. Sometimes we need to relax and just go with the flow, enjoying places both new and old in a more organic and fun way. It’s usually those experiences that become the most enjoyable and certainly memorable.